1955 Lincoln Cent. FS-101. 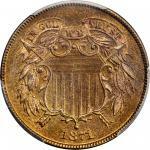 Doubled Die Obverse. MS-65 RB (PCGS).Virtually pristine surfaces and nearly full mint color set this beautiful Gem apart from the vast majority of Mint State 1955 Doubled Die Obverse cents extant. Gorgeous rose-orange color greets the viewer from both sides, there being only the lightest iridescent toning to confirm the RB designation from PCGS. Boldly struck and expertly preserved, this is a premium quality example for the assigned grade that is worthy of the strongest bids. 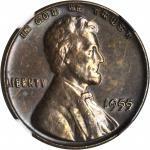 The story of the 1955 Doubled Die Obverse Lincoln cent was first told in detail by our own Q. David Bowers in 1964 in his first book,em Coins and Collectors/em, but is worth repeating in summary here: In 1955 Jim Ruddy (who in 1958 became Daves partner in the Empire Coin Company in Johnson City, New York), was shown a Lincoln cent with curiously doubled letters and numbers on the obverse. He found it interesting, and bought it for 25 cents. This attracted the attention of a newspaper writer who interviewed Jim, and he said he would pay a quarter each for all offered. After a couple dozen came in he rescinded his offer. It turns out that nearly all were found in cigarette packs. The price of a pack in a vending machine was 23 cents at the time. Anyone inserting a quarter would get a pack of cigarettes with two bright Lincoln cents under the cellophane on one side. At that time there was very little interest in mint error and die error coins. That did not happen until some years later when Frank Spadone, a New Jersey dealer, published a booklet on the subject and, also a bit later, Michael Kolman, Jr., of the Federal Coin Exchange in Cleveland, advertised and displayed struck mint errors (as opposed to error dies). Now in 2019 interest is intense in such fascinating die varieties, mainly propelled by the standard work on the series, emCherrypickers Guide to Rare Die Varieties/em by Bill Fivaz and J.T. Stanton. Dave contacted the Philadelphia Mint and spoke with the person who was involved. It turned out that on one particular day multiple presses were striking 1955 Doubled Die cents. Someone examining a bin in which the output for the presses had been dumped noticed a "freak" coin with blurred lettering. The press was identified and the offending die replaced. By that time the press had struck 40,000 pieces, 24,000 of which had been mixed with other coins and were sent out for regular distribution, there being no particular reason to save them. The others, still in a bin at the press, were destroyed. Thus, the net production amounted to about 24,000 pieces. In time, we believe in about a year, the variety was published, called the 1955 "Shift cent" by some. It was not until a few years later that it was listed in emA Guide Book of United States Coins/em, at which time Ken Bressett assigned the designation Doubled Die, which has since been applied to many varieties in other series. The coins caught on, became worth several dollars, and then even more.